Are you looking for easy way to upload pictures to Flickr website on Ubuntu system? 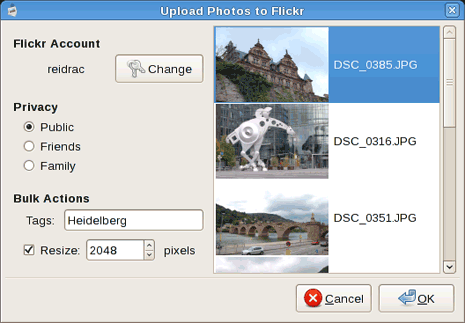 Nautilus Uploader program is a free and simple flickr image uploading tool. It has easy user interface for quick uploading of photos to Flickr website. You can login into Flickr account and upload images with specific tags, dimensions and privacy settings of public, private, family. 1. Download .deb package from here [more details]. 3. After install: select pictures that you want to upload, then right click to open them with this application and get going with Flickr upload process.